+–What is the objective of pdms training ? The objective of AVEVA PDMS course is to provide the delegates the in-depth knowledge and skills in this discipline to facilitate faster learning curves while on the job. 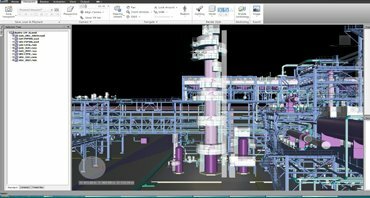 A PDMS (Plant Design Management System) piping designer uses 3D modelling software package for engineering, design and construction projects in onshore and offshore projects. AVEVA PDMS course will cover the fundamental principles and concepts used in plant design management system. Upon completion of AVEVA PDMS course the delegates will have a clear understanding of the design and engineering principles used in plant design management system (PDMS). +–Who should attend pdms training? He has 15 plus years of various experience of working. Foster wheeler Singapore, PETRONAS Malaysia, corporation of Malaysia (Water Plant). Hands on experience on software such as AutoCAD, Microstation Aveva PDMS, Navisworks, MS-Office, Nozzle Pro etc. Hand on experience in FPSO Topside module and process piping installation work. Checking and preparation of isometric drawings against master P&ID considering the integrity of the design base on project requirement, material specification, good design philosophy and practice. Preparation of bulk material Take off (MTO) from P&ID’s and Equipment Layouts. Preparation of Conceptual piping layout using Auto-Cad. Piping field weld and shop weld by using Software tools PDMS. Interference checking of piping with other equipments, structures & piping. Pipe Routing, Equipment & Structural Modeling using PDMS & Microstation. Extraction of Piping Layouts & Isometrics using Draft & Iso-draft modules respectively. ▸▾Who will benefit from PDMS course? Mr. R.Thangaraj is a graduated B. Tech production engineering from Anna University MIT campus Chennai. Having 15 plus years experience in senior piping design engineer (Engineering organizations of international repute) in various oil & gas / petrochemical / refinery / offshore / water treatment plant design etc. He has 15+ years of varied experience of working. Foster wheeler Singapore, PETRONAS Malaysia, corporation of Malaysia (Water Plant). Hands on experience on software such as AutoCAD, Microstation Aveva PDMS, CAESAR II, Navisworks, MS-Office, Nozzle Pro etc. Hand on experience in FPSO topside module and process piping installation work. Checking and preparation of isometric drawings against master P&ID considering the integrity of the design base on project requirement, material specification, good design philosophy and practice. Preparation of bulk material take off (MTO) from P&ID’s and equipment layouts. Preparation of conceptual piping layout using AutoCAD. Piping field weld and shop weld by using software tools PDMS. Interference checking of piping with other equipments, structures & piping. Pipe routing, equipment & structural modeling using PDMS & microstation. Extraction of piping layouts & isometrics using draft & iso-draft modules respectively. Reviewing equipment vendor GADs and finalizing nozzle orientations as per feasibility. Familiar with international design codes & standards. Involved In internal and external client review and updating of comments. Scheduling of outputs as per client schedule and preparing weekly progress report. Proficient in piping drawing preparations and checking of fabrication drawings. Experienced in checking of piping, fabrication, structural drawing & isometrics etc. Preparing spec, catalogue creation in AutoCAD, solidwork. ▸▾Pay-scale of PDMS Designer ? Vadodara, formerly called Baroda, is a city in Gujurat, a state in western India. The city have huge number of arts & science and engineering colleges, every graduates are eligible for become pdms designer, they give nearly 90 to 95% of results. Most popular core companies like petrofac, larsen & toubro are have their operating centers in vadodara. There is a bunch of opportunities for pdms designer to both fresher & experienced professionals. Enroll now & build up your career with us.